House Speaker Brendan Sharkey, foreground, and House Majority Leader Joe Aresimowicz in a recent meeting with the press. House Speaker J. Brendan Sharkey, D-Hamden, responded in scathing terms Monday to Gov. Dannel P. Malloy’s revised budget proposal, calling it “a public enemies list” and “a personal hit list,” not a basis for negotiating how to balance the budget. Sharkey, who also canceled a meeting scheduled for Tuesday with Malloy, appeared to be responding to Malloy’s statement Friday in an interview with The Mirror, as well as in an op-ed piece he published in the Sunday edition of The Hartford Courant. In both, Malloy suggested negotiations begin with his balanced budget proposal. Sharkey rejected that suggestion. 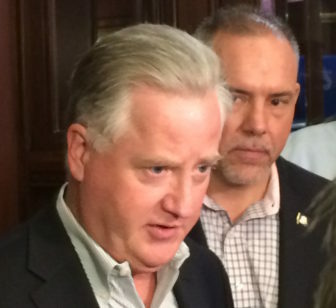 Sharkey and the Senate’s Democratic leadership notified Malloy’s office they would not attend what had been planned as a bipartisan meeting Tuesday. Malloy still intends to meet with the Republican minority leaders. Sharkey said Malloy’s proposal never could win passage. Sharkey indicated that the legislature will send the Democratic governor a budget based on its priorities, not Malloy’s. In his op-ed, Malloy challenged the legislature. But he ended on a gentler note. Durand questioned Monday whether Sharkey is willing to engage on the budget. The legislature’s constitutional adjournment deadline is midnight May 4.